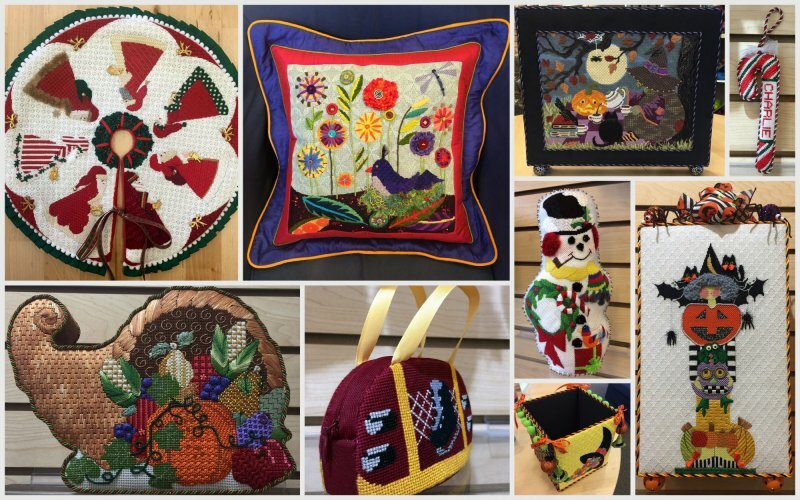 We know that you have put a lot of time and effort into stitching your needlepoint pieces, so we offer professional finishing services for Christmas ornaments and stockings, pillows and door hangers, purses and belts, kepahs and tallis bags, as well as a wide variety of interesting 3-dimensional items. We pride ourselves on providing consistent, high-quality and professional finishing for all of your stitched pieces. You may provide your own fabrics and trims, or you can let our finishers choose from their fabulous inventory of materials to create a finished piece that is unique to your stitched canvas! Please allow 8-10 weeks for finishing; 12 weeks for pillow finishing. All deadlines above are firm. Any items brought in after these posted dates are subject to a Rush Charge of $35 per item and must be confirmed by our finishers. If you have a specific 'Need By' date (for instance, if you decorate for the holidays on a specific date, or if you need to ship your finished piece to a relative/friend), please make sure to plan accordingly and bring your item in even earlier than the above deadlines. It is your responsibility to inform us of your 'Need By' date when you drop off your item(s) for finishing. We will confirm the need by date with our finishers.